Online privacy has been in a deepening crisis ever since Snowden decided to make the world aware of how their government has been spying on them. After the recent hack of Sony and other big companies, which endangered the privacy of many, Obama even acted and called for better privacy protection. To help defend your privacy from prying eyes, the SearchLock team has some tips on how you can improve your online protection. Though they do not grant complete immunity to being tracked, they do give great protection and will surely come in handy! Web browsers and search engines today give us the option to create an account and log in. They link your searches and activities to your account. This is a great feature but it’s also dangerous in terms of protecting your privacy. It makes it a lot easier for people to track your searches. Instead of having the trouble of identifying you, your account gives you away immediately. For better protection of your privacy, it’s best to search while logged out of your account. Click “Content Settings” in the “Privacy” section. Choose “Keep your local data until you quit your browser”. Go to the “Privacy tab”. To remove stored data by site, click the “Details button”. Then go to “Internet Options”. Then expand it with advanced options. Block “First-party Cookies ” and “Third-party Cookies”. Click “Always allow session cookies”. Choose Firefox will “Use custom settings for history”. 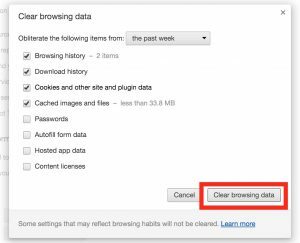 Enable “Clear history when Firefox closes”. You can click on settings to choose what to clear, but remember to enable cookies. Simply put, such software tries to hide your footprints. Instead of you communicating directly with someone else, your data passes through the anonymizing software, which encrypts and bounces your internet traffic through a series of computers before sending it to the recipient. This makes your footprints a lot harder to follow. There are different anonymizing programs out there, such as SearchLock. You can learn more about how SearchLock protects your searches here. Additionally, it really pays to be careful when using the internet. Many websites ask for your birthday, email address and telephone number. Be very careful when giving this information out. Make sure that it is a trusted website. One more thing. 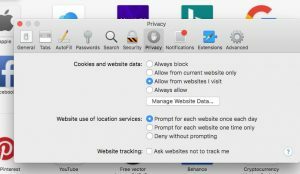 Using “incognito” in Chrome or “private browsing” in Firefox doesn’t mean that people won’t be able to track your searches. Yes, your searches are not listed in your history but you are still very vulnerable to bring traced and tracked. These steps will help a lot in protecting your online privacy but as I said earlier, this doesn’t mean that you will never be tracked. It is still possible to penetrate through all this protection but it will take more time for the hacker, making it not worth their time. I hope these tips help you to protect your privacy! If we find any more ways to secure your privacy, we’ll update you guys!